It’s been pretty darn hot the last several days here in Cleveland. I couldn’t even bring myself to fire up the grill. 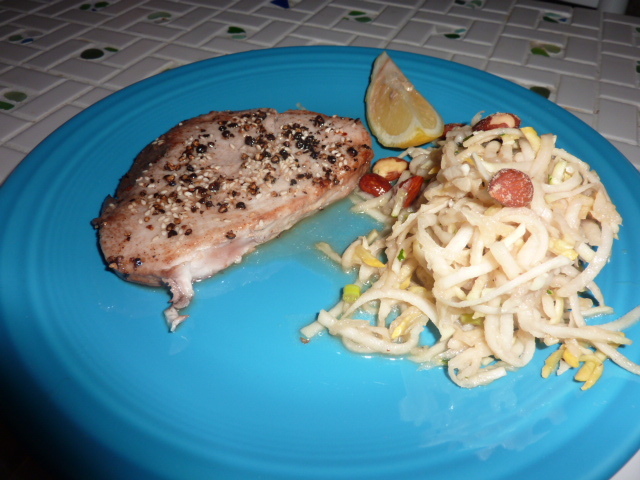 Instead, I decided to quickly pan-sear these beautiful albacore tuna steaks and pair them with a light, cold, and refreshing kohlrabi coleslaw. Kohlrabi is the perfect coleslaw ingredient – it tastes very much like cabbage, though slightly sweeter and more subdued, with a crunchy texture reminiscent of an apple. It’s flavors are clean and paired very well with the sweet onion, yellow squash, and zucchini used in this simple, healthy coleslaw. I used wasabi-soy almonds for some texture, but any nut would be equally delicious, I’m sure. The rich flavor of the tuna was the perfect pairing to this fresh summer coleslaw. Overall, it made for a really lovely dinner, though I’m sure the coleslaw would be a welcome addition at any summer pot luck or picnic. Whisk together canola oil and low sodium soy sauce. Let fish marinate about an hour. Remove from marinade, reserving marinade. Coat tuna with freshly cracked black pepper and kosher salt. Drizzle reserved marinade into a 10″ cast iron skillet. Heat over high heat until pan is very, very hot. Add fish and cook 2-3 minutes per side or until cooked to taste. Combine kohlrabi, onion, yellow squash, zucchini, and scallions. In a food processor, add freshly cracked black pepper, rice wine vinegar, and soy sauce. With food processor running, add sesame oil and canola oil and blend until well combined. Add dressing to vegetables and toss well to coat. Let sit, refrigerated, at least an hour to allow flavors to meld. Top with wasabi-soy almonds just before serving. This dish was packed with flavor and absolutely outstanding. When I saw this recipe for Burgundy Mushrooms at The Pioneer Woman, I knew it would be a wonderful, hearty substitute for a meat main. I needed to wait for a day when I would be around the house all day to make it, and today was that day. It was really nice to have the intoxicating scent of these mushrooms filling the house all day while I studied for my contracts final on Friday. Anyway, these mushrooms were worth the long cooking time (yes, it says 8 hours there). They were meaty and delicious and the sauce was packed with flavor. Additionally, it paired well against the bright citrus of the lemon kohlrabi greens and the creaminess of the Greek yogurt-seasoned polenta. 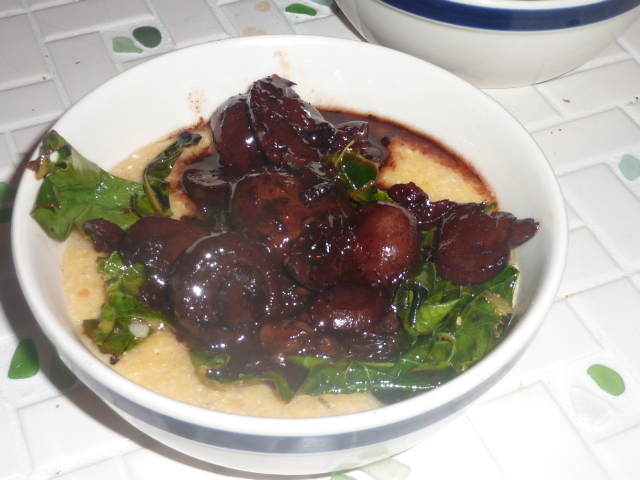 It doesn’t show up well in the picture, but this dish was absolutely beautiful – the sauce was a deep, deep purple-red, the polenta was bright and yellow, and the greens were vibrant green with a few flecks of bright zest. These mushrooms are certain to be a staple side dish for when I entertain in the future. Wash all the mushrooms and add to a large stock pot. Add remaining ingredients except kosher salt. Combine thoroughly. Bring the mixture to a boil over medium-high heat. Reduce heat to low and simmer, covered, for eight hours. If necessary to reduce sauce, uncover last hour or two. Add salt to taste at the end if desired (I didn’t). Serve over polenta and sautéed radish and kohlrabi greens. Heat olive oil in a medium sauté pan over medium-high heat. Add garlic and sauté until fragrant, about 1 minute. Add greens, lemon juice, lemon zest, kosher salt and freshly crack pepper. Sauté 10 minutes or until greens are tender. In a large saucepan, bring the stock to a slow simmer. Quickly whisk cornmeal into the stock and continue whisking until slightly thickened. Stir in the yogurt and salt and pepper, to taste. Continue to stir and simmer 10-15 minutes until creamy.